If you have been seriously injured in a private residence, public, government or commercial property due to the negligence of a property owner, you may be entitled to compensation. It is the responsibility of a property owner and / or manager to maintain an adequate standard of care in the event that a visitor will be entering the premises, so when potentially hazardous conditions are ignored—including spills left on the floor, slick or oily surfaces, uneven pavement, etc.—they may be held accountable for their negligent actions through the concept of premises liability. How Can You Receive Compensation? If you have reasonable evidence to prove that either of these factors lead to the accident that has caused you harm, you should not hesitate to take legal action. In the aftermath of a slip and fall accident, it is important to act quickly by retaining the assistance of an experienced Chicago slip and fall attorney as soon as possible after an injury was sustained. Attorney Phil Berenz is here to help. Slip, Trip & Fall Accidents in Chicago: Act quickly! Owners and tenants of retail stores, grocery stores, restaurants, government buildings, private residences and business offices have a duty to maintain the property in a reasonably safe condition and to post warnings when a hazard exists. 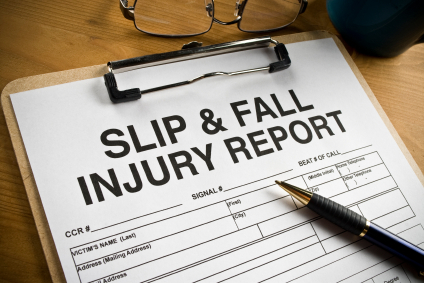 Children, pregnant women, and the elderly are especially likely to be severely injured in a slip and fall accident. After an injury has occurred, the owner or staff members will take steps to resolve the hazard to ensure that no one else will be injured in the future, and to ensure that evidence that could be used against them is quickly removed. After a slip and fall accident, the insurance company involved will frequently dispatch investigators to conduct interviews of witnesses and gather evidence to assist in limiting owner or tenant’s liability. It is very important to quickly contact Slip and Fall Lawyer Phil Berenz who can take immediate steps to photograph and document the accident scene and preserve evidence vital to proving the facts of your case. If you have been injured in a slip and fall accident, you may be entitled to compensation for your medical expenses both past and future, lost wages, future lost income, pain and suffering, as well as other damages through a personal injury claim. Chicago slip and fall lawyer Phil Berenz can protect your rights and is prepared to aggressively pursue financial compensation on your behalf. Contact Phil to schedule a free case evaluation at 312-375-6524 to discuss your case.